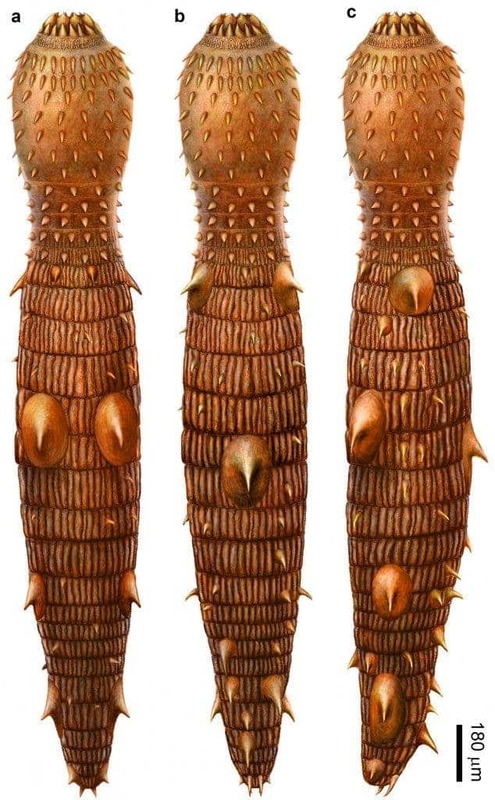 It basically looks like a weapon: the fossil of a worm-like animal from the Cambrian period has been presented by scientists, and it’s as armored as it gets. Credit: An artist’s reconstruction of Eokinorhynchus rarus, a 535-million-year-old fossil from China that is closely related to the ancestor of modern animal phylum Kinorhyncha, which is a member of moulting animals that also include the arthropods and nematods. Eokinorhynchus rarus is only a few millimetre in length. It is the first fossil kinorhynch unearthed from the rock record. The Cambrian was definitely one of the strangest geological and biological stages in Earth’s history; it’s not only that it was 500 million years ago, but the Cambrian explosion was firing at all cylinders. The Cambrian explosion was a (relatively) short evolutionary event during which most major animal phyla appeared. Basically, life was trying to fill out all the available ecosystem niches, and many extremely strange creatures emerged. Such is the case with Eokinorhynchis rarus. Eokinorhynchis rarus has five pairs of large bilaterally placed spines on its trunk and may be related to a group of creatures called kinorhynchs. Kinorhynchs (also called mud dragons for some reason) are a phylum of small (1 mm or less) marine invertebrates that are widespread in mud or sand at all depths (except extreme ones). However, unlike these creatures, our Eokinorhynchis is heavily armored and has larger spines – but it may be an ancestor of the mud dragons. The body is divided into three sections: a head, a neck and a trunk. These are some of the earliest creatures found with segmented bodies, so they could provide clues on how body segmentation emerged. Shuhai Xiao and colleagues at the describe several fossils, including E. rarus from the early Cambrian period and offer their expertise in Nature.